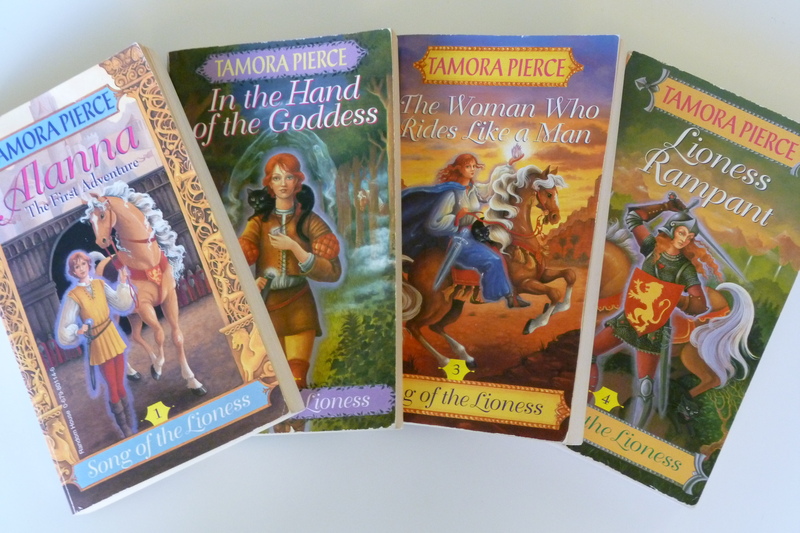 I feel like I talk about Tamora Pierce and her wonderful Song of the Lioness Quartet fairly often…but it was a long time ago that I actually reviewed the books! Since I’m a little occupied this week with releasing my new novel (which happens to be about a strong heroine in a magical world), it seems like an appropriate time to dust off this review about one my favorite strong fantasy heroines! Am I talking about some great inspirational work? Well…not a traditional one. I’m talking about the Song of the Lioness Quartet by Tamora Pierce. The first book is Alanna: The First Adventure. Alanna is a girl who wants to become a knight, except that girls aren’t allowed to become knights. So she disguises herself as a boy and sets out to become one anyway. Alanna is an incredible character. When I was younger, I basically wanted to be her when I grew up. She’s stubborn, determined, and incredibly brave, but also human–she makes mistakes, she has struggles, and she’s not always sure of herself. She was my favorite character when I was a kid, out of any book I’d read. The series has a host of memorable characters, with new ones arriving in later books as well. A couple of favorites include Prince Jonathan, every girl’s dream of a handsome and charming prince, and George Cooper, the roguish and equally charming King of Thieves. They all live in a world of swordplay and tournaments that is nevertheless grounded and believable–swing a sword around too long and you’ll have sore muscles. They also live in a world of magic. Alanna possesses the Gift, which she can use for various spells, some practical and some dramatic. There is also an entire pantheon of gods who occasionally step into mortal affairs. The books are funny, exciting, engaging…amazing. And they changed my life. I’m a firm believer that a girl can do anything a boy can do, that women have the same rights as men, and that we all ought to be equal, whether in pay rates or in who cleans the house. I’m sure a lot of that belief comes from my parents, especially my mom, but I think reading about Alanna at a young age helped. I also met one of my best friends because of Tamora Pierce. We were freshmen in high school, and were both shy book-lovers. We were in a class together, but hadn’t talked. She was reading a Tamora Pierce book, and so was I. I can’t remember now who talked first, but we’ve later admitted that we each noticed the other one’s book, and each took out our own book before class started in the hopes that the other one would notice and use it as an excuse to start a conversation. She’s still one of my best friends; we’re both eagerly awaiting Tamora Pierce’s next book, promised for this February. You may also be recalling right now that in Fiction Friday, I’ve featured some of my writing about a girl who disguised herself as a boy so that she could become a pirate. It’s not a coincidence that my character’s name is Tamara. Song of the Lioness is my favorite quartet by Tamora Pierce. She’s written other books set in the same world, and many characters, Alanna included, turn up in those books. I recommend those as well. I love that you met one of your best friends through reading Pierce! And that you’ve stayed friends. It’s always interesting to see which Tamora Pierce heroine is someone’s favorite. Alanna is a lot of women’s favorite, especially if they first read her when they were young. I didn’t discover Pierce until I was a mother with a daughter almost old enough to read her! I like the Alanna books, but I’ve always preferred Kel, I think for two reasons. One, Pierce was a better writer by the time she wrote The Protector of the Small quartet, and it shows. (Not that the Alanna books are badly written; they’re not. But they lack the maturity of her later books.) But mainly it’s because Alanna is a “chosen one” character and Kel, by and large, is not. Kel isn’t a mage, she doesn’t have a god(dess) watching over her, she doesn’t have a magic familiar. She’s an ordinary girl, who becomes extraordinary through hard work and perseverance. In other words, she’s not “special”, so she really does show that girls can be and do whatever they set their minds on doing.